Wrist strain is common in sports like tennis and golf. It is also seen in the workplace due to use of the computer (typing, clicking the mouse). Overuse of the wrist can lead to symptoms of tingling and numbness in the fingers. This is called Carpal Tunnel Syndrome. 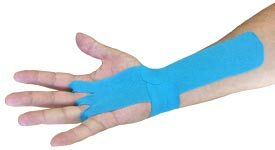 Taping your wrist can help with your Carpal Tunnel symptoms, as well as provide compression on the median nerve. Another wrist condition you may want to apply tape for is called De Quervain's Syndrome, which causes pain on the side of the wrist below the thumb. 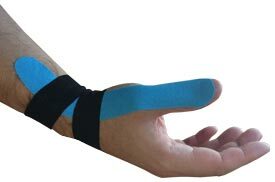 Taping can provide additional support and protection for the soft tissues in the affected area, helping to prevent re-aggravation. This is important during activities that cause your symptoms to flare up. You should tape your wrist prior to doing any activity that will involve heavy use of your hand and wrist. Take one full length piece of tape (about 10 inches long) and cut it in half, rounding the corners, so you have two pieces that are each about 5 inches long. Apply the strip around the top of your wrist, using 80% stretch in the middle and no stretch on the ends. Apply the other 5 inch strip around the inside of your wrist, using 80% stretch in the middle and no stretch on the ends. Take another full length piece of tape and tear the backing off one end, anchoring it to the top of your hand, just below your middle and ring fingers, using no stretch. Peel the rest of the backing away from the tape and use 25% stretch to pull the tape down over the top of your hand and forearm. Take one full length piece of tape (about 10 inches long) and fold one of the ends over about an inch. Cut two small holes in the folded over part of the tape. Tear the backing off the cut end of the tape and place the hand palm side up. Put the two middle fingers of the hand through the two holes in the tape. Lay down the cut end of the tape over your knuckles with no stretch. Peel the backing off the rest of the tape and apply it down the length of your hand, wrist and forearm. Take another full length piece of tape and cut it in half, rounding the corners, so you have two pieces that are each about 5 inches long. Using full stretch, apply the middle part of the tape to the underside of your wrist. Lay down the ends of the tape with no stretch. Hold your hand up on it's side so all of your fingers are pointed outwards, with the thumb pointed up and the tip flexed outwards. Take one full length piece of tape and cut it in half length-wise, giving you two long, thin strips. Take one of the thin strips and tear the backing off one end, anchoring it to your thumb nail with no stretch. Using 25% stretch, pull the tape down past your wrist and anchor it to your forearm, laying it down with no stretch. Flex your wrist down and relax your thumb so you can rub the strip into the skin along your thumb and wrist. Take another full length strip of tape and cut it in half so you have two pieces that are each about 5 inches long. Take one of the 5 inch strips and cut it two thirds of the way down the center to make a "Y" shape. Tear the backing off the un-cut end of the tape and anchor it to the middle of the inside of your wrist with no stretch. Remove the backing from one of the "Y" arms and use 50% to pull it over the top of your wrist, laying down the end with no stretch. Remove the backing from the other "Y" arm and use 50% to pull it over the top of your wrist, laying down the end with no stretch. Position your hand so your fingers are pointing outwards, with your thumb in an upright position and the tip of your thumb pointed down. Take a full length piece of tape (about 10 inches long) and cut it down the center, rounding the edges, to create two long, thin strips. Take one of the long, thin strips and tear the backing off one end, anchoring it to your thumb nail with no stretch. Use 50% stretch to pull the tape down past your wrist and lay it down on your forearm with no stretch. Flex your wrist down so you can rub the tape into your skin. Take the other long, thin strip of tape and tear the backing off one end, achoring it just above where the first piece was anchored, so it goes over the tip of your thumb. Wrap the end of the tape over your thumb to ensure it sticks. Using 50% stretch, pull the tape down past your wrist and lay it down on your forearm with no stretch so it's just below where the end of the first piece is. Using 80% stretch in the middle and no stretch at the ends, apply the tape over the base of your thumb, rubbing it in to ensure sticking. Take the other 5 inch strip and tear the backing in the middle, peeling it away so you are holding onto the two anchor ends. Apply it about an inch below the previous piece, over the base of your thumb, using 80% stretch in the middle and no stretch and the ends.